Up to now, this complex and growing waste stream has been very difficult to recycle. Yet doing so offers tremendous opportunities to recover valuable resources. Given that 58% of plastic bottles are recycled, the public has a clear enthusiasm for recycling. A key area of focus for the Reflex multi-partner project is the optimisation of near infra-red (NIR) sorting technologies to detect and separate mixed polyolefin (PP and PE) packaging, such as sweet wrappers, crisp packets and bread bags. 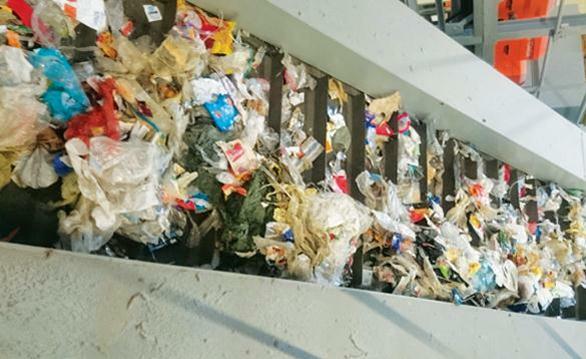 NIR technology is capable of sophisticated sorting, such as identifying and rejecting problematic flexible packaging structures containing incompatible materials which could degrade the recycled polymer. Research has concentrated on ‘tweaking’ current NIR technology to recover polyolefin material from a heavily-contaminated mixed film waste stream, with the aim of achieving high purity and high yield by using off-the-shelf technology. This makes it a practical solution that would be straightforward and cost-effective for the industry to adopt. Despite the challenges that remain in sorting a lightweight material such as film, successful results in terms of detection of different kinds of polymer are being obtained. Optimisation will broaden what can be sorted and separated for recycling from mixed post-consumer flexible packaging, thereby improving the separation efficiencies and yield of recoverable material achievable. Capturing this mixed polyolefin packaging would open up exciting options for the types of recycled polymers that could subsequently be made from it. Early breakthroughs have emerged in evaluating alternative packaging designs which are potentially more suitable for recycling and yet still deliver the performance and technical properties needed for the products in them. These include taking multi-layer packaging structures that currently use incompatible polymers and redesigning those applications using polymers and structures which can potentially be recycled together. Positive results achieved in the first 10 months of the project have been very encouraging, and attracted high levels of interest internationally, including brand owners, nongovernmental organisations and packaging suppliers. Recycling flexible packaging is still technically and commercially challenging, so the project will continue over the next year to explore options and processes. These will be trialled at every step to determine and demonstrate the most commercially viable solution. The project team will research innovative ways of marking recyclable packaging to enable automated sorting, new barrier polymers and novel packaging designs for simpler recycling, along with smarter reprocessing technology. Looking ahead, studies will examine how flexible packaging can be reprocessed into high-quality recycled plastic pellet suitable for use in the manufacture of a wide range of products. It is anticipated that the market will follow a similar model to that for plastic bottle recycling and take 10 years to mature to a point at which more than 50% of flexible packaging is diverted from the waste stream. The Reflex project is an inspiring example that could become a circular economy blueprint because it contains all the elements of the new network needed to close the loop on this form of packaging. The project was recognised in Packaging Europe’s Sustainability Awards 2015 as an “industry-leading exemplary model of collaboration”.